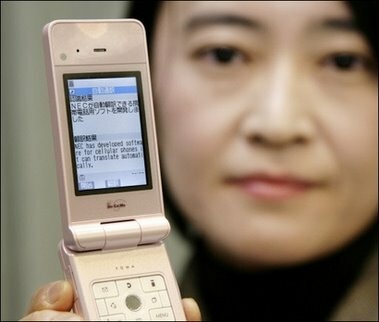 Just one second after the phone receives the spoken Japanese words, the cellphone shows the Japanese characters on the screen. In another second, the English version appears. The software recognizes 50,000 Japanese words and is optimized for the translation of phrases commonly used by travelers, like "Can I have a subway route map?" According to NEC, this is the first time that this software has been made available on a cellphone, with no need for networked capabilities. The earliest reference that I know in sf for an automated language translator is the language rectifier from Hugo Gernsback's 1911 classic Ralph 124c 41 +. The Babel of languages is starting to get a bit easier to work with; take a look at the Fuji Xerox Copier with automatic translation, the LingoPhone, and the Phraselator in use in Iraq. Via NEC Develops First Translation Software on Cellphone.